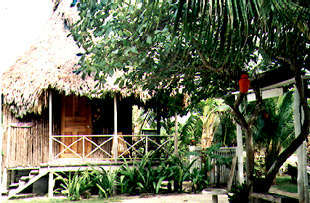 Hotel del Rio "Our Belize Vacation" - "Our Belize Vacation"
On the exotic island paradise of Ambergris Caye, located near the San Pedro River, is Hotel del Rio. 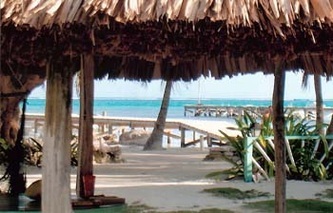 Hotel Del Rio is unique because of its authentic thatched roof cabanas much like the primitive structures traditionally used in Belize. 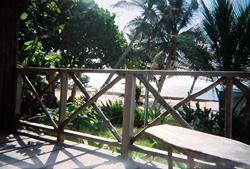 These beachfront accommodations allows quests to enjoy the unspoiled and untouched beauties of its foliage. 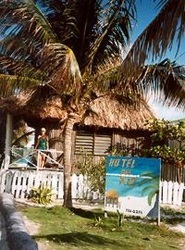 This ecologically friendly hotel was Lonely Planet's pick for Ambergris Caye. A half a mile away lies the largest barrier reef in the Northern Hemisphere, the second largest in the world. The corral formation, home to a bountiful array of tropical sea life, is a diver's or a snorkeler's dream come true. AT TARPON ALLEY GUIDE SERVICE WE HAVE A FULL ARRAY OF FISHING GUIDES AND BOATS AVAILABLE. FROM FLY FISHING FOR BONE FISH OR TARPON TO REEF FISHING FOR SNAPPER. An incredible variety of activities and excursions are available to traveler's but if rest and relaxation are what you are craving, you can rejuvenate lying on the white sand beaches and take a dip in the pristine waters. The walk to town is a short seven minutes where you can stroll through the streets to see the many gift shops, boutiques, art galleries, and restaurants which offer local and international cuisine. You will feel well away from Western civilization in this easy paced village. The serene atmosphere at Hotel Del Rio along with the breathtaking view of our palmed lined beaches and the crystal blue hues of the water will make your stay one you will never forget. Chica is our most popular unit. 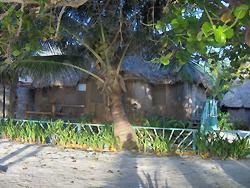 It is a quaint authentic bungalow with a thatched roof. Its wrap around porch offers an ocean view on one side and faces the center of the hotel, a common meeting place for the social gatherings of guests, on the other. The wooden slat windows are opened easily for a cooling ocean breeze. These, along with a ceiling fan make the room quite cool after a day in the sun. 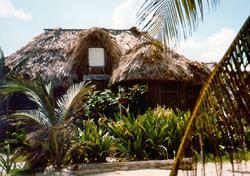 Cabana Chica includes a double bed, a hot water shower and a refrigerator. 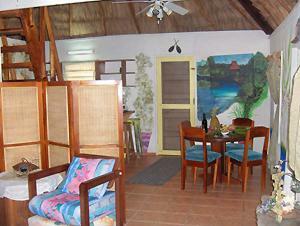 Casita is a quaint bungalow with thatched roof. 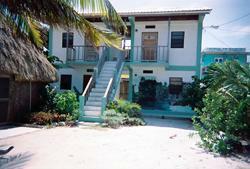 Its large porch faces the ocean and our common meeting area. 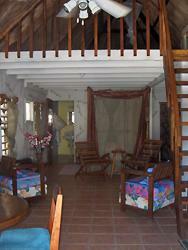 The wooden slate windows open to the ocean beezes and with the ceiling fan makes for a delightful home. Casita includes hot shower and refrigerator. 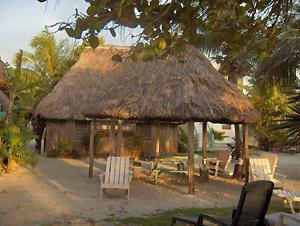 This thatched roof bungalow is popular with groups and with families. 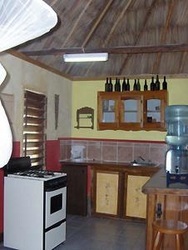 It offers a complete kitchen and two double beds. Its open suite like layout makes Grande very roomy and creates a comfortable place for people to join together at the end of their day and trade stories of their activities or excursions. 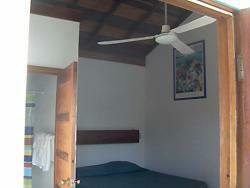 Grande has several windows, which can be opened for a lovely ocean view or to create a breeze. 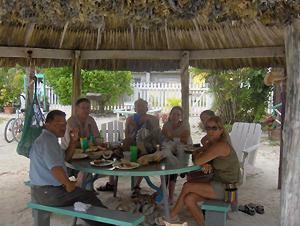 The ceiling fan adds to the cooling effect of this ocean air. In each room of this Spanish style complex, guests enjoy air conditioning, a ceiling fan, a private hot water bath, and a refrigerator. 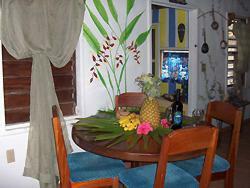 These rooms each have a touch of Belizean artwork. The outside displays a large mural of a jungle/rainforest scene painted by a well-known local artist. 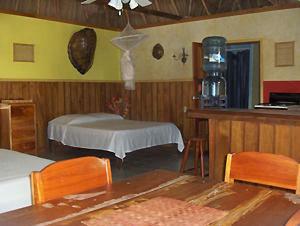 With Casa Blanca comes the choice of a double bed or two twin beds. Each of the rooms face the same palm covered oceanfront that has inspired much of the art within. 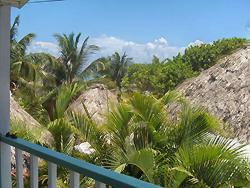 The Palms come with private bath, ceiling fans and verandas that face the ocean and palms. The single has a double bed for one or two people and the doubles have two double beds for up to four people. An additional single bed in The Palms can be arranged.